Daisy Chain Invites have compiled a list of beautiful poems and readings which can be incorporated into your wedding ceremony. There are some suitable for all types of wedding ceremony, church weddings and more informal civil ceremonies. There are serious readings and light hearted fun readings. We have even included a Pam Ayres poem! Get your friends and family involved in the ceremony and ask them to do a reading. 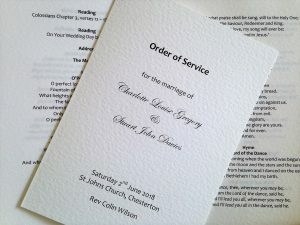 Selecting your own readings makes for a much more personal ceremony and your friends and family we be pleased to be included in such a special event. Like our page on Facebook so that you can find them again when you are ready to confirm your ceremony details. Scroll down for some examples of beautiful poems and readings for your wedding ceremony. …the one I love with every fiber of my soul. Tomorrow was a lifetime away, now suddenly it’s here. How did it happen so quickly? This wedding drawing near. How can I act so happy? How can I act so gay? When in such a very short time, I’ll give my daughter away. So I could let my heart catch up, but I know it never will. No one ever warned me about the day the job is done. Yet, there is another side, where my heart is not as sad. When I look in my daughter’s eyes, I can’t help but be joyful and glad. This day she has dreamt about, for just about all her life. She’s going to be such a beautiful bride and a loving, caring wife. I’ll stand with the congregation as my daughter walks down the aisle And even though there are tears in my eyes, my face wll bear a smile. For I know that I was very blessed when God lent this child to me. To love and care for and nurture, so she would grow up to be This lovely, bright young woman, who tomorrow will be a bride And as always I’ll be there, with love at my daughter’s side. Let your love be stronger than your hate and anger. Learn the wisdom of compromise, for it is better to bend a little than to break. Believe the best rather than the worst. People have a way of living up or down to your opinion of them. Remember that true friendship is the basis for any lasting relationship. The person you choose to marry is deserving of the courtesies and kindnesses you bestow on your friends. Never marry but for love; but see that thou lovest what is lovely. He that minds a body and not a soul has not the better part of that relationship, and will consequently lack the noblest comfort of a married life. Between a man and his wife nothing ought rule but love. As love ought to bring them together, so it is the best way to keep them well together. A husband and wife that love one another show their children that they should do so too. Others visibly lose their authority in their families by their contempt of one another, and teach their children to be unnatural by their own examples. Here it is we ought to search out our pleasure, where the field is large and full of variety, and of an enduring nature; sickness, poverty or disgrace being not able to shake it because it is not under the moving influences of worldly contingencies. Nothing can be more entire and without reserve; nothing more zealous, affectionate and sincere; nothing more contented than such a couple, nor greater temporal felicity than to be one of them. Within the circle of its love, marriage encompasses all of life’s most important relationships. A wife and a husband are each other’s best friend, confidant, lover, teacher, listener, and critic. And there may come times when one partner is heartbroken or ailing, and the love of the other may resemble the tender caring of a parent or child. Marriage understands and forgives the mistakes life is unable to avoid. It encourages and nurtures new life, new experiences, new ways of expressing a love that is deeper than life. Then Almitra spoke again and said, “And what of Marriage, master?” And he answered saying: You were born together, and together you shall be forevermore. You shall be together when white wings of death scatter your days. Aye, you shall be together even in the silent memory of God. But let there be spaces in your togetherness, And let winds of the heavens dance between you. Love one another but make not a bond of love: Let it rather be a moving sea between the shores of your souls. Fill each other’s cup but drink not from one cup. Give one another of your bread but eat not from the same loaf. Sing and dance together and be joyous, but let each one of you be alone, Even as the strings of a lute are alone though they quiver with the same music. Give your hearts, but not into each other’s keeping. For only the hand of Life can contain your hearts. And stand together, yet not too near together: For the pillars of the temple stand apart, And the oak tree and the cypress grow not in each other’s shadow. May you always need one another – not so much to fill your emptiness as to help you know your fullness. A mountain needs a valley to be complete; the valley does not make the mountain less, but more; and the valley is more a valley because it has a mountain towering over it. So let it be with you and you. May you succeed in all important ways with one another, and not fail in the little graces. May you look for things to praise, often say, “I love you!” and take no notice of small faults. May you enter into the mystery which is the awareness of one another’s presence – no more physical than spiritual, warm and near when you are side by side, and warm and near when you are in separate rooms or even distant cities. May you have happiness, and may you find it making one another happy. May you have love, and may you find it loving one another! Daisy Chain Invites are suppliers of affordable wedding invitations and wedding stationery. 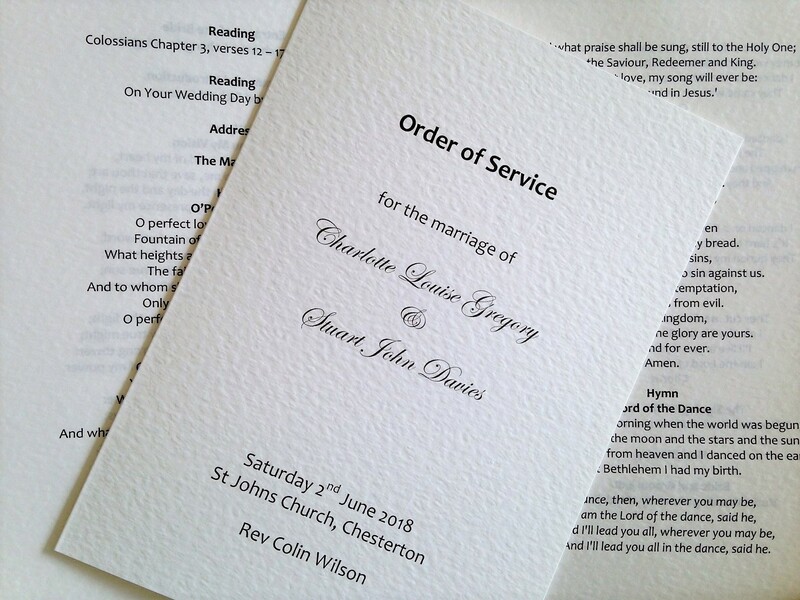 We can supply order of service books for all wedding ceremonies.